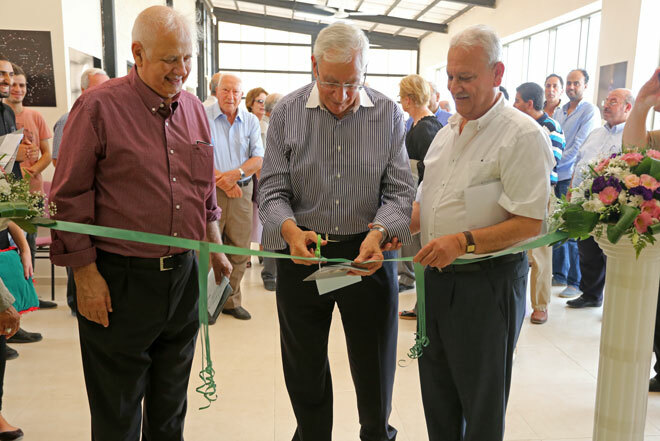 Birzeit University celebrated on September 10, 2015 the opening of the Michel and Sanieh Hakim Observatory, which was established with a generous donation from Ramez Hakim to commemorate the memory of his parents. The observatory will help spread the culture of astronomy throughout society, especially among students, in order to observe Palestine’s night sky and place Palestine on the map of astronomical research. Chair of Birzeit University's Board of Trustees Hanna Nasir inaugurated the observatory and thanked Hakim for the donation. He hoped it will help meet the goals of the astronomical observatory, supply the Palestinian society with experts and individuals interested in astronomy, prepare astronomical research and allow the observation of Palestine’s night sky using advanced equipment. He noted that Birzeit University’s interest in astronomy can be traced back to 55 years ago when the science club's students in Birzeit University created a four-inch telescope. Birzeit University’s President Abdul Latif Abu Hijleh stated that the university will never cease to support events and activities that encourage students to be more creative. The university helps its institutes and community centers in reaching the Palestinian community outside its campus. He went on to thank the students in the physics department and others for the personal efforts exerted to establish the astronomy club one and a half year ago. The club has been very active in observing planets appearing in Palestine’s night sky, hosting students interested in astronomy from Birzeit and other neighboring schools, organizing astronomical events and observing phenomena such as the solar and lunar eclipses. The observatory’s donor expressed pride in Birzeit University and the academic and national roles it plays. He explained that the observatory is a way of commemorating his parents, who are originally from Jaffa, but were forced to leave it in 1948. The observatory is located on the upper floor in the Education Faculty, which was built on a 178 square meters with the observatory right in its center. There is another 120 square meters allocated for the lobby. Physics Department head Wafa Khater said the observatory will aid students and individuals interested in learning about orbs using the telescope and attending lectures and seminars. They will also have the chance to observe astronomical phenomena, communicate with Arab and international astronomers, enroll in astronomy courses, learn how to operate the telescope, establish astronomy clubs and nourish a scientific environment and engage with the science of astronomy. At the end of the opening ceremony, astronomy club students introduced the observatory and its components to the audience.